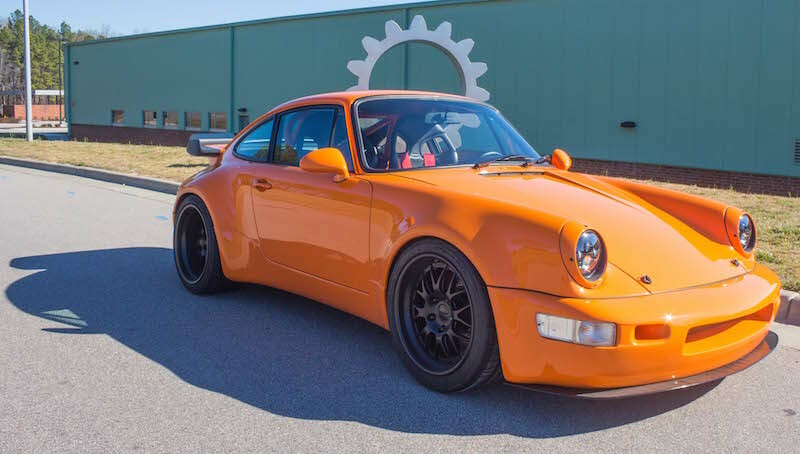 Any latter-day Porschephile will be impressed, if not amazed, at the attention to detail and the quality of assembly on display in this 2300-lb purpose built hot rod. The road behind this car, however, contains some twists, turns and a few surprises. 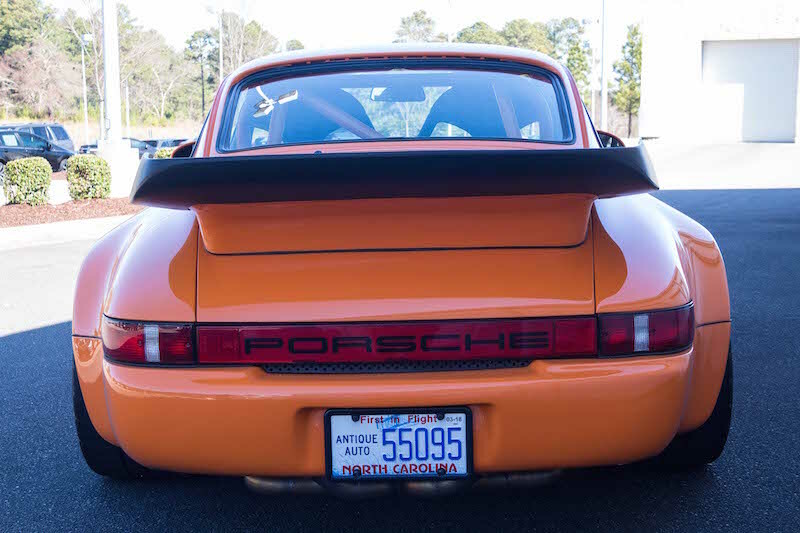 Caution: this car is not for the purist at heart. Roy Taylor was looking for a donor body to fulfill his wish for a competitive track car that he wouldn’t mind flogging. He already had a 2016 GT3-RS that was capable of that, but the pebbles and detritus that lurked trackside to pummel his car were too much for Taylor to allow; he needed something cheaper to sustain that level of abuse, a sort of “beater” Porsche. 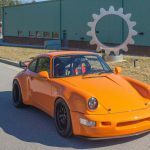 With this idea in mind, Taylor settled on a 1976 912E that was being used as a showroom demonstrator for Better Bodies Motorsports in San Ysidro. The all-white roller sported BBM’s 965-style body kit for 2011 and served as the perfect starting point for Taylor’s dream. After a short stay in a shop that could not handle the needed transformation, the project was brought to Kanon Best at Flat 6 in Raleigh, North Carolina. There it was torn-down and built back-up using mostly Porsche parts. An Elephant Racing performance suspension was clipped in, and 930 brakes and cross-drilled rotors were fit. The roll bar installed was from a 964, the seats from a 996 GT3. Rennline pedals, RS-style door pulls, and a painted dash were combined to evoke an older, simpler age. 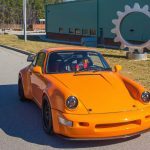 A 930 limited-slip transaxle was modified to handle the tremendous torque load of the engine. And the engine is, well, not a Porsche. 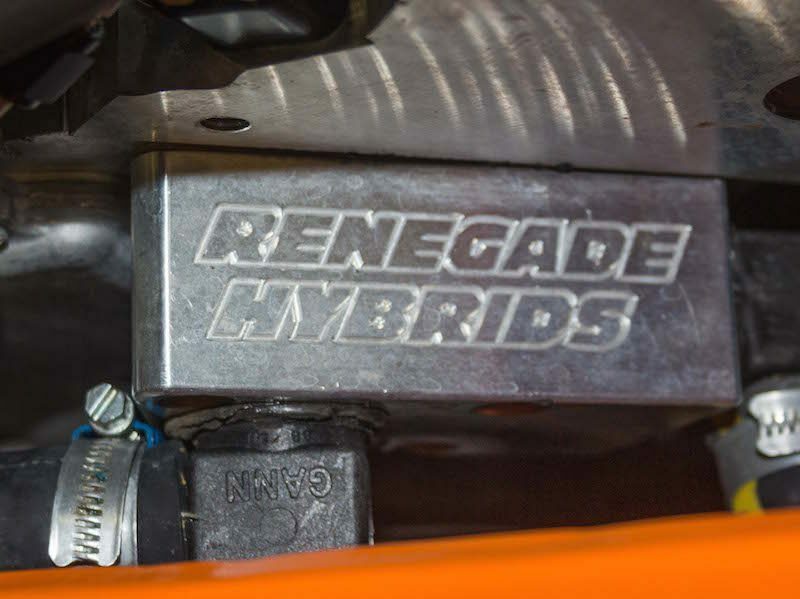 It is, in fact, an all-aluminum 2008 Chevrolet LS-6 crate motor supplied by Renegade Hybrids of Las Vegas. The largely stock Chevy pushes 343 horses to the BF Goodriches out back and, blasphemy notwithstanding, this engine takes up less engine bay and weighs 40 fewer pounds than a stock 911. Up front an all-aluminum radiator is boxed in front of the racing fuel cell. A restyled front bumper guides air to the radiator, after which two fans exhaust it under the body. Aircraft-quality cabled hoses run coolant through the rockers to connect radiator to engine. There is nothing exposed or unprotected on this car; everything from chin spoiler to exhaust tip was made tidy, tight, and purposeful. 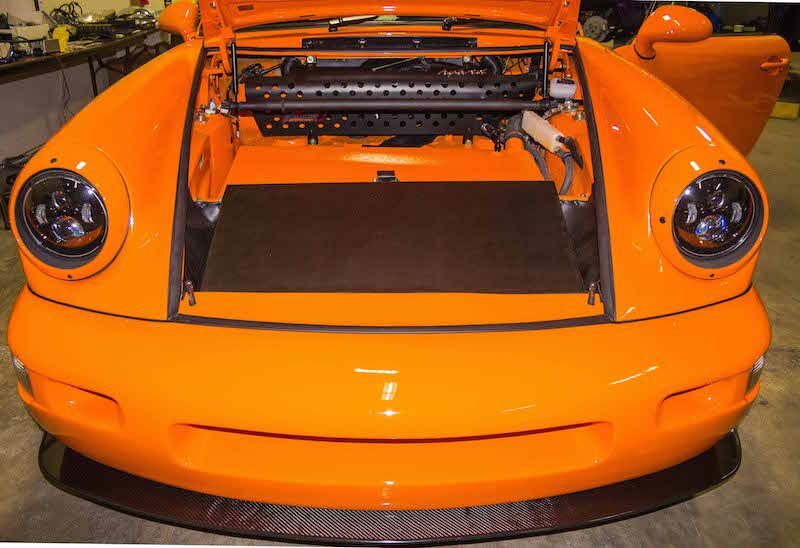 The body’s orange paint is best described as “intense,” and the black Forgeline Racing rims and all-black trim accentuate the elegance of the whole package. To insure that the paint remains unscarred, Taylor has also completely wrapped the body with 3M Invisible Mask. The car has come together just as Taylor envisioned it, with a menacing loud bark, brutal acceleration in any gear, and uncanny cornering ability. Yeah, sure... Once bitten, twice hooked. That’s how the old saying goes, right? A true *OUTLAW* – well done. Now that’s thinking outside of the box ! Awesome job !!! !